Recently, Constant Contact introduced a new preheader feature which allows you to add text in a field, just below the subjectline, which appears in some email inboxes. I have always been a fan of the long subjectline. I know that many email ‘experts’ will cite stats on how short, clever subjectlines get more clicks. And sometimes they do! So when you can, include something short and pithy in this field. But if you are trying to convey important information, I highly recommend including that in the subjectline. This way, even if the recipient does not open the full email, they have at least seen the important info. I like to think of the subjectline as a text message to the recipient. This is especially useful with an event. I would recommend ‘LinkedIn Profile Optimization Webinar 11/12 at 3(ET)’ instead of something like ‘Are You Embarrassed by Your LinkedIn Profile?’. This way, even if they don’t open the email, they KNOW you have a webinar on that subject at that date and time. The Preheader function allows you yet another field to include information. With the Preheader, you could now use BOTH of those subjectlines. Though I would still suggest the topic/date/time version for the primary subjectline as you will see below that the Preheader is NOT always visible. Depending on your recipients email inbox and the device they will be using to view their inbox, subjectlines display at different lengths with mobile devices generally providing the shortest subjectline character count. A Preheader essentially helps you gain more real estate in your recipients inbox – use it wisely! You can also view an article that will go over the header options in more details by clicking here. Here are some examples of where the Preheader IS and IS NOT visible. This is a small sampling and I highly recommending testing this for yourself, using the Constant Contact preview function and your personal and professional email addresses. Take a minute to check your contact list, to see what email services most of YOUR recipients use. To check this in Constant Contact, go to the ‘Contacts’ tab and using the search bar, search on the more popular personal account services such as GMAIL, Yahoo or AOL. Note that since many larger corporations have filters in place that block mass mailings (even if your recipient wants to whitelist you, they cannot) it is often desirable to have personal email addresses in addition to, or even in lieu of, professional addresses for all of your contacts. If you are using the Constant Contact Toolkit version, they also provide stats for each mailing showing the number of desktop vs. mobile opens, which give you an idea of how people may be seeing your mailings. I do NOT usually enable the preview feature on my desktop version of Outlook, so as you can see, I do NOT see the preheader field. Here you can see that the long subjectline (65 characters!) is NOT clipped and the preheader IS visible. Here again, they allow the full subjectline AND the preheader. Here, both the subjectline and the preheader are visible but both are snipped (shortened). Hopefully, these tips and samples will encourage YOU to use the Preheader feature in YOUR Constant Contact mailings. Remember to use the field wisely! 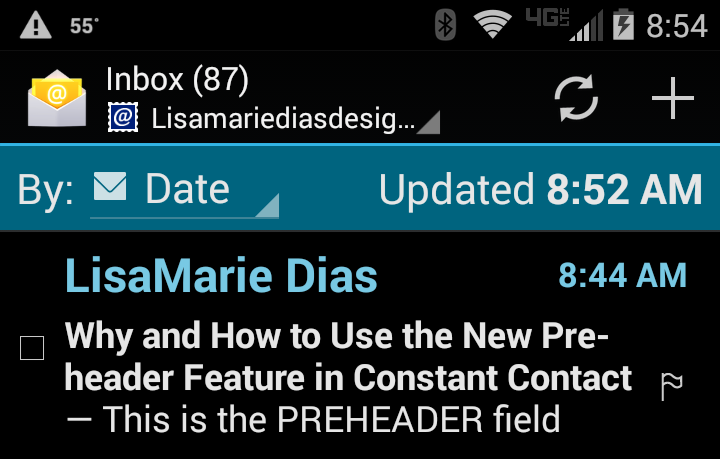 Great article Lisa, any idea how to keep CC from picking up extra content after the preheader in the preheader. Ours like to grab code from our header in our email. Thank you for reaching out to the Community. 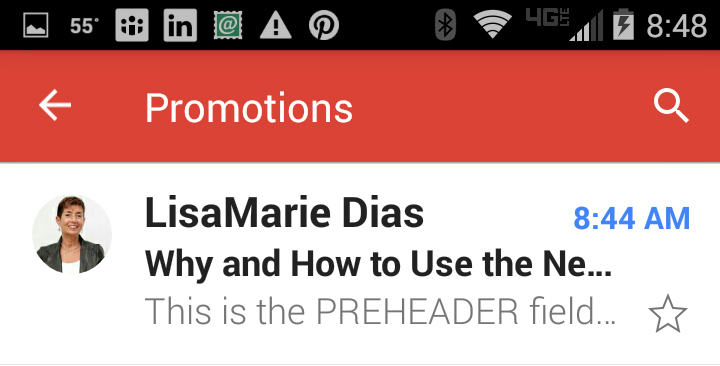 I can definitely understand how useful it would be for the PreHeader not to pick up additional content from the email. At this time, PreHeaders will pick up any initial content that is contained within the email body. 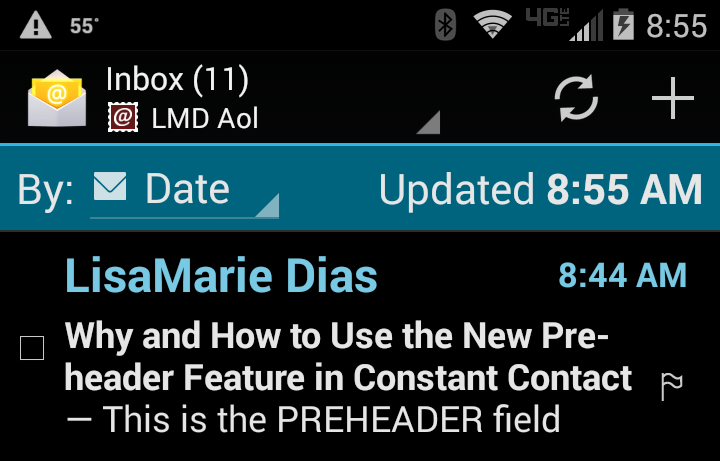 You can try adding the content that you would like to have populated in the PreHeader at the top of you email. Click here for an article that will show you exactly where you can edit your PreHeaders within the email. I apologize for any inconvenience. I will be submitting your feedback for investigating purposes. Please let us know if there is anything else we can assist with today. So glad you asked this question Tracey. I have been wondering for a long time, pretty much since the preheader field was introduced, what is the point of it if you cannot restrict the field to the content you put in the preheader. We find we are writing longer and longer preheaders to avoid this problem! The answer, not so helpful though. Hi @JulieL34. You brought up a great point. Just to confirm, are you seeing content from the newsletter appear after the preheader when viewing your inbox? If this is the case, this is not something that we are able to control as the inbox will display whatever content appears after the subject line or preheader but I can certainly understand how you would like to be able to have control over how your subject line and preheader appear before the email is opened. It's also worth mentioning that not all email clients even display the preheader! Although you can create a longer subject line or preheader in order to prevent the campaign content from showing in the inbox, we caution against it as longer subject lines can look like spam to some contacts. We recommend keeping the subject line between four and seven words and the preheader should be on the shorter side as well since it is merely there to enhance your subject line. Julie, you could also try holding down the space bar for an extended space, and then end with a period. The system will interpret it as intentional, and only display white space after the words you want to be visible. Even if the period appears at the end of the line, it won't distract from your pre-header message. And if any stray code does still get picked up at the end of the space, you'll have a nice big buffer between it and your intended content. Thanks for sharing this workaround here in the Community! We hope other users can find this helpful. Thanks! This sounds like a great workaround, and I'm looking forward to trying it.